i well realise the obviousness of my pointing it out, but the island of islay sits tidily on the european edge of the north atlantic ocean. tautologically, this means our localised atmosphere is more salt-laden than your average fish-supper, a fact that manifests itself in a variety of less than welcome ways. particularly in the winter months when the wind reaches speeds above that of a draught, i have embarrassingly returned review bicycles with rusted stem bolts and brake cable clamp bolts. all in the space of a couple of weeks. there is little i can do but apologise to those with the equanimity to send review models in the first place, but you can perhaps imagine the effect the climate has on the bicycles and components that live here all year round. but, i hear you say, surely aluminium alloys are far less susceptible to this corrosive vapour, for aluminium doesn't rust. perfectly true, but aluminium does oxidise, and it would seem, from personal experience, that islay has a pervasive habit of promoting such oxidisation beyond the pale. i have already lost the use of two sets of high quality anodised hubs due to serious corrosion-based cracking at the spoke holes. anodising is an electrolytic process that thickens the natural oxide coating on aluminium, increasing the surface hardness and increasing corrosion resistance. it also allows a series of pretty colours. the problems i've had with corrosion attacking my hubs are the result of microscopic fissures; despite anodising producing a regular and uniform coating, it doesn't carry one of those 100% guarantees. keronite, however, is rocket science. unlike anodising, keronite is not a deposited coating. it is grown from the parent metal, in this case, aluminium. technically, it is a peo; plasma electrolytic oxidation. the process was developed for the 1960s space programme to perpetrate lightweight, strong and corrosion resistant components for space travel and satellites. the keronite process can make the surface of soft metals much harder and more wear resistant than steel or glass; a defect-free layer of dense, ceramic material that sticks hard to the base metal, four times harder than hard anodising and up to seven times more wear resistant. did i mention that keronite is british, both the name of the company responsible as well as the nomenclature for the coating? generally speaking, keronite sounds like the very stuff we'd all like to have coating our expensive trinketry, particularly if you're a member of velo club d'ardbeg. i only wish someone had applied it to the rear dropouts of my colnago c40 before they disintegrated into a fine grey powder. had the notion for applying keronite to bicycle bits been mine and mine alone, i could likely hang up my word processor right now and live off the proceeds of my scientific genius for evermore. but mavic beat me to it. you can search the mavic website from top to bottom without finding any mention of the word keronite, and there's a perfectly good reason for that. they call it exalith, and they're now applying it to rims and hubs at the top end of the mavic range. fascinating as all the technology can be (and for once, the word technology has real meaning) there's always the possibility that this is a use of same to add a further degree of credibility to an already excellent product. surely the only way to figure out whether or not this is the case, is to stick a pair of exalith coated wheels on the company colnago and ride. and in true, predictable fashion, that's exactly what i've done. the wheels in question are mavic's r-sys slr, a remarkably impressive looking pair of hoops that arrive with mavic's yksion power-link tyres, weighing a mere 1365grams without those black tyres and a still impressive 1960 grams with. the exalith coating, aside from everything else that's promised, looks as if it owns the ability to casually ride past jodrell bank without so much as a blip on the oscilloscope. stealth is an understatement. the rims benefit from mavic's ism machining, removing unnecessary material from between the chunky carbon spokes, 16 radial up front, and 20 at the back. due to the power differential experienced at the rear, the carbon spokes are built radially on the non-drive side, but are replaced with ksyrium style flat spokes built two-cross on the drive-side. i have no idea whether there are those amongst us who purchase a set of wheels for cosmetic value alone, but it does have to be said that these look undeniably incredible on the bike. black spokes, matt black exalith and all black tyres, the colnago looks screamingly impressive just leaning against debbie's wall. i've ridden r-sys wheels before; mavic kindly sent a pair of their very first version some years back, a pair that had the front wheel replaced when mavic decided there might conceivably be a problem with those front carbon spokes under particularly bizarre circumstances. 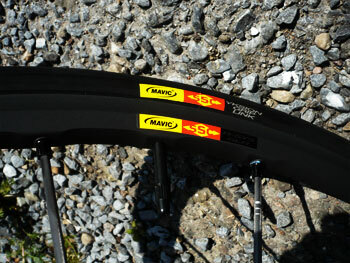 mavic employs the word tracomp to describe the fact that the spokes work both in traction and compression; regular steel spokes do not work in compression (have you ever tried compressing a steel spoke along its length? 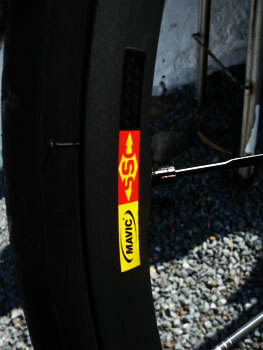 ), but mavic's carbon spokes do, preventing rim deflection under heavy load. not that i'm sure i can apply the sort of loads we're talking about. the exalith coating, aside from the abilities already discussed, provides a very hard coating that for an improved level of braking. of course, since it is substantially different from regular anodising, it needs specific brake pads, four of which arrive with the wheels and mavic branded wheel bags. 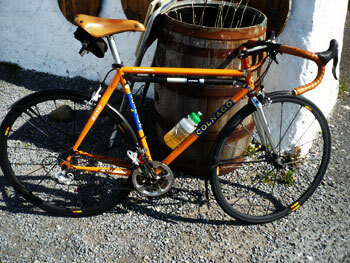 the brakes on the colnago master are sram red, and it is indeed a happy coincidence (?) that pads for sram brakes are seemingly identical to those of shimano. campagnolo is the one out of step, so to speak, but then if you'd bought a pair of r-sys with a campag pattern freehub, the pads supplied would be an ideal match. so far so good, but all show and no go would rather mitigate against the level of product expected from mavic; riding the colnago seemed like an excellent second step. just like their original predecessors, there is a level of comfort to be had from a pair of r-sys that can really only be attributed to those carbon spokes. but these are performance wheels; comfort is surely of secondary consideration? what we want is unadulterated speed, something the relative weightlessness of circular stealth promotes the heck out of. do not for a minute misunderstand me; speed is a relative term and there is little doubt that mine is the poor relative, but the low rotating weight of the r-sys adds a certain frisson to each and every ride. stand up for a matter of seconds on an uphill bit of road, and gravity seems to have lost its grip just a tad. brilliant fun. the braking surface has a wavy tactile surface pattern, which may be engineered to dissipate heat. unlike a regular anodised surface, the exalith coating takes a longer period of breaking-in during which it doesn't half remove material from the green-faced brake pads. hopefully when completely at ease with life, brake pad wear will ameliorate somewhat, but it's the first time i've found it necessary to keep a daily eye on those wear slots. that said, despite the rather cool sounding whine that accompanies every application of the calipers (just like the lotus 52b gas turbine formula one car of yore), braking is remarkably good, and set to get a lot better. 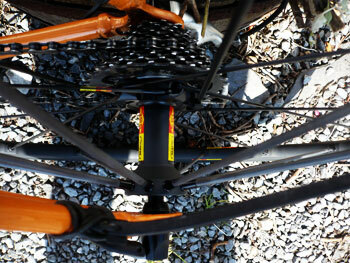 exalith may be the very saviour against the instigation of disc brakes in road-racing. the yksion power-link tyres will be the subject of a slightly lengthier review than these immediate words, but i already have cause to be thankful for a grip-factor greater than i'd expected. while whizzing downhill before taking a ninety degree bend, i kept well to the inside due to an anticipated pile of gravel inhabiting the centre of an already loose surface. unfortunately, at a speed probably on the limit of my ability to control, it appears the gravel had been dancing in the night and now inhabited the very line i was less than confidently taking around the bend. though i'd already started to look for a soft place to fall, the bike sailed through the bend without so much as a wheel stepping out of line. believe me, this had nothing to do with my rudimentary bike handling skills. 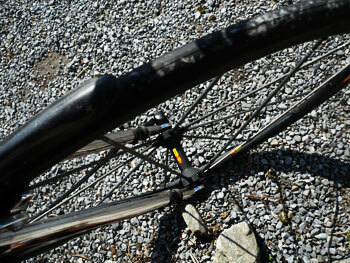 rear wheel grip on crappy uphills has been no better or worse than comparable quality tyres. 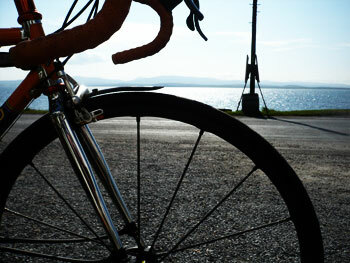 today's ride afforded some wet weather testing. that's not what was intended; i simply fancied a coffee, but on the way home, the summer weather downpoured with a vengeance on previously dry and dusty roads. the change in climate put the yksions neither up nor down, and certainly imparted no loss of confidence in their road-holding abilities. i think it unfair to underwrite a pair of wheels and tyres in such a short space of time, so there will be a part two, but unless the uci issue an edict barring radar invisible rims anytime soon, i think the colnago and i will both be sporting large grins by the time the next bit is written. so, if i'm using rocket science, does that make me an astronaut? i always wanted to be an astronaut. mavic's r-sys slr exalith wheels retail at approximately £1300 and come with the necessary hub and spoke adjustment tools, four exalith compatible brake pads and mavic branded wheelbags.